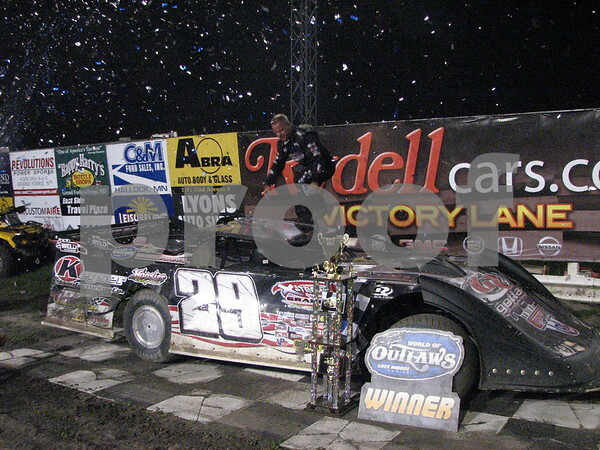 Grand Forks ND: #29 Darrell Lanigan World of Outlaw Late Model Feature Winner 7-13-12 at "The Legendary Bullring" River Cities Speedway. This was no ordinary win as this was the worlds closest World of Outlaw inish between 1st and second place since electronic scoring has been in place. Darrell Lanigan passed #44 Clint Smith on the last lap on the last corner of a 50 lap World of Outlaw Feature and difference between 1st and second was only .024 hundreds of a second. Click here for original posting. "The Bullring" Photo of the Day!